Crocheting is such a versatile craft that with little imagination and knowledge about stitches,any one can create beautiful things . 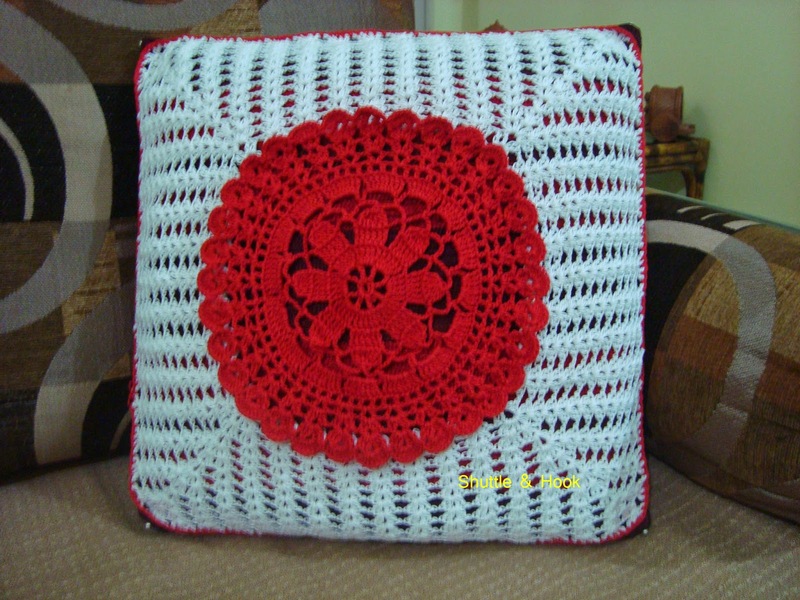 I made this cushion cover with a doily in center. My own design. Doily pattern is from net. I changed the pattern to make it suitable for this design. The square part of the cushion cover is done with shell pattern , Overall it gives a artistic look. Here I am giving the written pattern for doily and the square part . cluster - keep last loop of each tr in hook ( don't finish the tr), in hook you have 6 loops, pull thread through all the loops to make a 6tr cluster . finish - sl st in 4th ch of beginning 4ch . Number of shells in last line of doily must be multiple of four. I have used hook size 3 mm . You can change hook size according to your tension. 8ch , sl st in beginning ch to make a ring. Rnd 1- 7ch ( counts as a tr,3ch) * 1tr , 3ch * repeat * * 6 more times, sl st in 4th ch of beg 7ch. Rnd 2 - 4ch (counts as 1tr through out) , 4tr in next sp, 1ch, * 5tr in next sp , 1ch *, repeat * * 6 more times , finish. Rnd 3 - 4ch , tr in next st , 2tr in next st, tr in each next 2 sts , 5ch ,*tr in next 2 sts,2tr in next st , tr in next 2 sts (6tr), 5 ch* repeat * * 6 more times , finish . Rnd 4 - 4ch , * cluster , 6ch , sc in next sp , 6ch * repeat * * 7 more times , finish. Rnd 5 - sl st in next 3ch ,sc in same sp * 8ch , sc in next sp , 8ch * repeat * * till end, sl st in beg sc. Rnd 6 - 4ch , 7tr in next sp ( 8tr) , repeat 8tr in each sp , finish . Rnd 7 - 4ch (counts as 1dc , 1ch), skip next dc , * dc in next st , 1ch , skip 1dc *, repeat * * till end , sl st in 3rd ch of beg 4ch. Rnd 8 - sl st,get in to next sp , 5ch ( counts as 1dc, 2ch) , dc in same sp,1ch, skip next sp * 1dc 2ch , 1dc in next sp ,1ch , skip next sp * repeat * * till end , sl st in 3rd ch of beg 5ch. Rnd 9 - 2 sl st,get in to next sp , 3ch (counts as a dc) ,1dc,2ch ,2dc in same sp , repeat 2dc. 2ch , 2dc in each 2ch sp till end , sl st in 3rd ch of beg 3ch . Rnd 10 - 3 sl st to next 2ch sp ,3ch , 2dc ,3ch ,3dc in same space, repeat 3dc,3ch,3dc in each 2ch sp till end , sl st in 3rd ch of beg 3ch. Rnd 11 - 4 sl st to next 3ch sp , 3ch ,7dc in same sp , sc in next sp, repeat 8dc , sc in next sp till end , sl st in 3rd ch of beg 3ch. The doily is finished . Fasten off . shell - (2dc ,1ch ,2dc. 1ch) in 1ch space. finish - sl st in 3rd ch of beg 3ch. Rnd 1 - Join col B in any backside two loops of doily. Sc in same sp*,9ch , skip 1 shell, sc in next st* repeat * * till end , sl st in beg sc . Rnd 2 - sl st in next 3 ch, 3ch (counts as a dc through out) ,1dc,1ch,2dc in same sp , do shell in next 6 more sps,for first corner do 2dc ,3ch 2dc in next sp , do shell in 7 more sp ,do 2nd corner. repeat shell and corner twice to get four corner , finish. Rnd 3 - Do same as Rnd 2 up to corner , in corner do 2dc , 1ch ,2dc , 1ch,2dc ,1ch ,2dc in 3ch sp. repeat shell and corner till end , finish . Rnd 4 - Do same as Rnd 3 up to corner , in corner do 2dc ,1ch ,2dc in each 1ch sp , repeat shell and corner till end , finish . Rnd 5 - Do same as Rnd 4 up to corner , in corner do 2dc , 3ch ,2dc in middle shell. Here you get two more extra shell added in each corner , repeat shell and corner till end , finish. Repeat Rnd 3 ,4 ,5 three more times to get a 14" square. Last Rnd - Join col A , 1ch ,1sc in same sp, sc in each sp ,3sc in each corner, repeat till end sl st in beg ch . Fasten off , weave the ends. Square is ready now . It can be stitched to a fabric cushion cover .I have stitched to black fabric cushion covers .Here I recommend to stitch the middle doily properly . Or make a granny square for back. Do as you wish . Both way it will look beautiful . For any information or query about the pattern, you can contact me through e-mail.